Baja California is famous for its dramatic landscape of boulder fields, cactus-studded mountains, and nearly 2,000 miles of rugged coastline. While Baja may be arid and earth-toned above water, below the surface it transforms into a colorful and biodiverse ecosystem. Nicknamed the world’s aquarium by Jacques Cousteau, this region is one of Mexico’s most impressive destinations for dive travel, yet it’s often overlooked by tourists in favor of the Yucatán. If you want these stunning sites all to yourself, the time to visit is now. Diving this good won’t stay a secret for long. If you’re looking for an authentic Mexican experience, La Paz is a great place to get off the gringo trail. It’s a favorite destination for Mexican nationals but feels worlds away from the tourist crowds of Cabo San Lucas. Stroll the Malecon, eat a few fiery seafood dinners, and check out the local organic market for a taste of the real Baja California Sur. 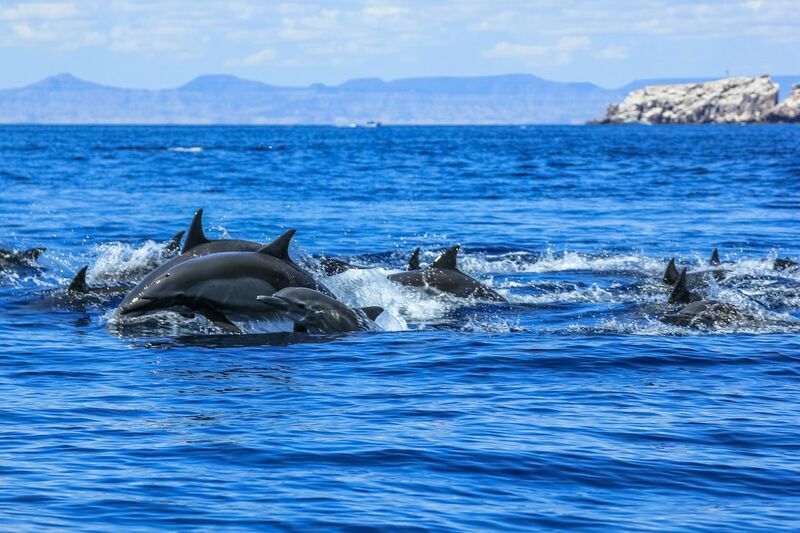 Just an hour offshore, the islands Espiritu Santo and Los Islotes are the gateway to Mexico’s Sea of Cortez. Lucky visitors might spot orcas, dolphins, and whales on the boat ride out. But, the real stars of the show here are the region’s super friendly California sea lions. These underwater acrobats are known for their playful antics and up-close encounters. Springtime is best for diving and snorkeling with the curious pups. Underwater photographers might want to bring a small hand mirror along. Sea lions love interacting with their own reflections and can really ham it up for the camera. From October to May, whale sharks — the biggest fish in the world — gather in the shallow waters around the bay of La Paz to feed. These gentle giants eat mostly plankton and are perfectly safe for divers and snorkelers. 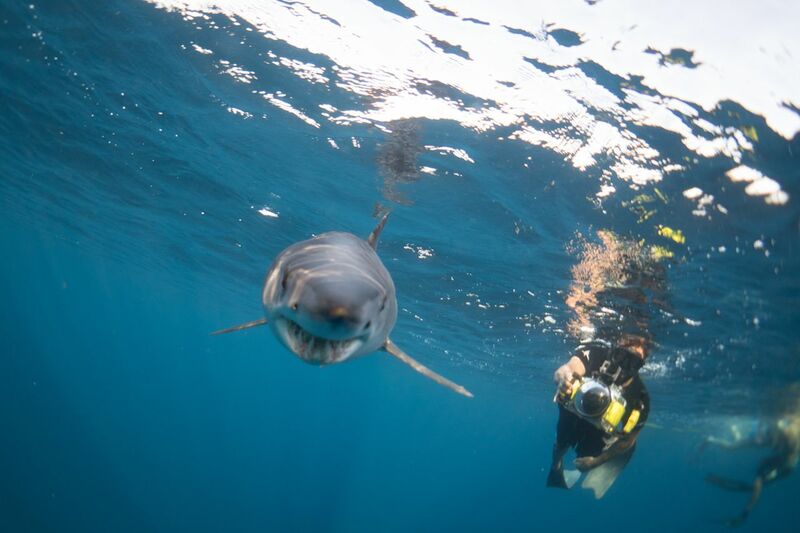 Most encounters take place on the surface where the sharks slowly cruise in search of their next meal. Don’t go to Cabo Pulmo expecting luxury hotels or all-inclusive resorts. There’s no nightlife, internet access is spotty, and the drive into town is an adventure. So, it’s a destination best left to more intrepid travelers. But if you’re up to the challenge, you won’t be disappointed. Diving in this national park is some of the best in all of Mexico. Thanks to decades of protection, Cabo Pulmo National Park has transformed into a scuba diver’s paradise. Once badly overfished, these waters are now known for massive schools of snapper and grouper, mobula rays, sharks, and even the occasional orca. 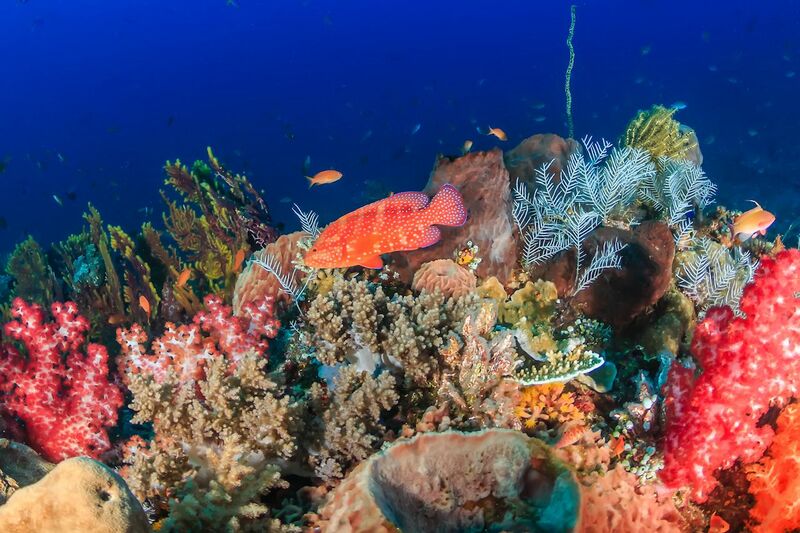 This is the most extensive coral reef in the Sea of Cortez, so you can expect plenty of colorful fish and critters, too. Fall and winter months are best for diving here, especially if you’re hoping to come face to face with the region’s megafauna. Humpbacks, manta rays, and bull sharks are the park’s most famous residents. If you aren’t a certified diver, Cabo Pulmo still has plenty to offer. There’s excellent snorkeling just offshore and at some of the dive sites. Guided kayaking tours are another excellent option for those who prefer to stay topside. The twin cities of Cabo San Lucas and San Jose del Cabo are classic Mexican resort towns. All-inclusive hotels dot the coast, and a night out typically includes famous drinking destinations like the Cabo Wabo nightclub. But, it isn’t all bad. Los Cabos is a great jumping off point for some excellent scuba diving, as well as other watersports like fishing and sailing. A quick boat ride to famous sites like Land’s End and Neptune’s finger will take you straight to the center of Cabo’s underwater adventures. Reef sharks, sea lions, schooling barracuda, and massive grouper make regular appearances at these dive sites. But wildlife isn’t the only draw here. Dramatic underwater rock formations make this one of the most topographically interesting areas to dive in all of Baja. If you’re up for the hour-long boat ride, the Gordo banks submerged seamounts are well worth the trip. During fall months, these far offshore sites become a magnet for large pelagics like sharks and rays. While hammerheads, bull sharks, and mobulas make for the most exciting encounters, massive schools of tuna, snapper, and jacks also gather here. Home to powerful Pacific currents and open ocean conditions, this diving area isn’t for the faint of heart. It’s only accessible via liveaboard, and the boat ride takes an entire day. But visitors who are up to the challenge will be well rewarded. Because of the remote nature of these sites, advanced scuba certification and experience are required for all visitors. At Socorro, don’t dive here expecting to see coral. These offshore seamounts and pinnacles are known for their dramatic drop-offs and plummeting walls of solid rock. But what Socorro and the Revillagigedo Islands lack in reef life, they make up for in big fish. This area is known for one-on-one encounters with whale sharks, dolphins, and manta rays, as well as a chance to spot silky, Galapagos, and hammerhead sharks schooling by the hundreds. 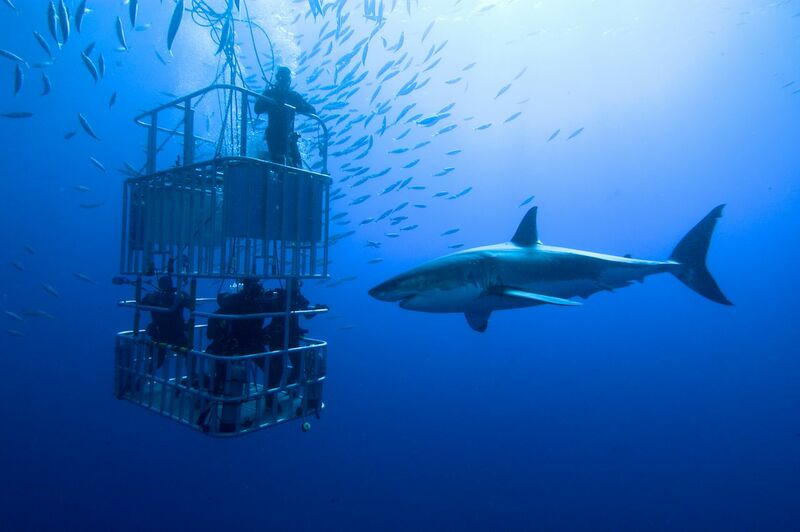 Divers come to Guadalupe to see just one thing: great white sharks. During the summer and fall months, the sharks gather here in great numbers. But most divers agree that you’ll see the most massive females between August and October. Dives in this region are performed inside of cages, and some operators use surface-supplied air. You won’t do any swimming on this trip. Instead, expect plenty of stationary time dedicated to shark observation and photography.